“Goodnight”, “sleep well”, “sweet dreams”. These are just some of the phrases that we may whisper to our kids, to our partners and other loved ones, before going to bed at night. But how many of us actually get a night of good quality sleep, have sweet dreams, and wake up rested, ready for what the new day brings? According to statistics, not many. Yet, sleep deprivation has significant personal and global health impacts, as well as economic. In light of World Sleep Day (March 15th), I believe it’s a topic that deserves significantly more attention. In the words of the now-renowned sleep advocate, Arianna Huffington, we’re in the midst of a “sleep deprivation crisis.” In the world of work hard and even harder, never-ending Netflix shows, excessive screen time, aspiring to have it all, we compromise on our sleep and even let sleep disorders go untreated. According to the Centers for Disease Control and Prevention, “about 70 million Americans suffer from chronic sleep problems. And it is estimated that more than 100 million people worldwide suffer from sleep apnea, 80 percent of whom remain undiagnosed and, globally, 30 percent of people experience difficulty in initiating and maintaining sleep.” Poor sleep leads to more than weary eyes, though; it is also strongly linked to depression, obesity, diabetes, heart disease, stroke, neurocognitive disease and even cancer. Good, restorative sleep is vital to treating and managing other health conditions as well. The big question is: when will we realize that we need to do something about our unhealthy sleep habits and routines? Many people think six hours of sleep is sufficient, but it’s not. Scientific research shows that there are clear risks of not having enough sleep. We typically start noticing daytime symptoms such as having low energy or difficulty concentrating, and finding ourselves asleep on the couch instead of in the comfort of our beds. These are probably the most prevalent indicators of not having enough good quality, restorative sleep during the night. The factors that lead up to these results are complex and we do not often notice or recognize them, meaning we don’t even realize we are sleep deprived. Our lives are dynamic, and so is the sleep. One of the important influencers of maintaining good sleep quality is our ever-changing lives; moving to a new job, having a (snoring) partner we share the bed with, having kids, changing health conditions, changing living environments or even the cities we live in… I remember the remarkable change when I moved to the Netherlands from Istanbul—from a busy life in a cosmopolitan city to an apartment located next to a park with much less noise was an eye-opening experience for me that made me realize the impact that our living environments have on our sleep quality. I believe that understanding the influence of our daily life routines on our sleep starts with being aware. Some of the findings from our annual Philips global sleep survey, conducted among more than 11,000 people in 12 countries in honor of World Sleep Day (March 15th), confirm that indeed, “lifestyle factors and sleep disorders stand in the way of a good night’s sleep. On lifestyle factors alone, survey respondents indicated that their sleep is most impacted by worry/stress (54%), sleep environment (40%), and work or school schedule (37%).” And, interestingly, we even refer to sleepiness as a daytime performance issue. But, if sleep is so important to staying healthy, why don’t we spend more time talking about it openly with one another, and seeking help and solutions, like we do when it’s regarding exercise and nutrition? Today we know which elements of our daily life contributes to better sleep, or in other words, the ‘sleep hygiene’. Sleep hygiene is essentially a set of guidelines that helps us to have better sleep. These include not having caffeinated drinks close to our bedtime, choosing our gym time accordingly, not having heavy meals before sleep, having enough daylight during the day and minimizing our screen exposure at night, and so on. Almost everyone knows about these guidelines, yet it is difficult to turn them into habits. As our behavioral change leader, Dr. Mark Aloia has said, “change is a funny thing”. Good news is, in today’s connected world with a number of devices that can provide data about our physiology, we are better empowered to take sleep into our own hands. However, this requires us to change some of our habits. It means being motivated to change, and being aware of the importance of good sleep as well as about the solutions that can address the issues causing poor sleep. There is no one-size-fits-all sleep solution. Each person is different and has different sleep needs. Simply put, sleep is complex. And this is linked to multiple dimensions—from a number of physiological to psychological aspects. There is no one-size-fits-all sleep solution. Each person is different and has different sleep needs. This emphasizes the importance of an ecosystem innovation that can bring various solutions in the sleep ecosystem together in a seamless user experience. And this is what I, and my fellow colleagues, aim to transform, in partnership with other innovative companies. Together, we are working to raise greater awareness on the importance of sleep, change the predominant sleep narrative, and help lead the global sleep revolution through more customer-centric solutions. What we are doing at Philips is what we have been doing for decades. We are using our proven deep clinical expertise in sleep technology and the knowledge from our partners to make better sleep accessible for everyone. The multidimensional aspect of achieving good sleep triggers us to think about solutions that touch upon sleep from different angles. We believe collaboration is essential to making this possible. To drive an ecosystem innovation approach, we run several Startup Programs a year at Philips HealthWorks. Our current program in Eindhoven and Cambridge (MA), focuses on Healthy Sleep, with 6 exciting startups. "It is extremely rewarding to collaborate with pioneering health technology partners and entrepreneurs, and to pursue our goal of combining many impactful innovations into one holistic customer-centric solution. One that can truly impact people's lives and change healthcare worldwide", says Lana Caron, Innovation Lead at Philips HealthWorks. The Philips global sleep survey shows we want better sleep, but only if it comes easily. Nowadays, consumers want to take - and will take - control of their own health. The Philips global sleep survey shows we want better sleep, but only if it comes easily. People expect seamless experiences. That is why I believe that it should always be the consumer in the driver’s seat when it comes to healthcare innovation, to enable them to prioritize their sleep needs and address challenges head-on. I believe that doing so will help them to prevent further health issues that a lack of quality sleep can perpetuate. This is what inspires me to get up every day. As we mark World Sleep Day on March 15th, I urge everyone to take a step back and examine their own sleep habits. I certainly will and will encourage my family and loved ones to do the same. Sleep is essential to living a long, healthy and happy life. For more information about World Sleep Day 2019 and how Philips is observing the day in your local area, visit www.Philips.com/SmartSleep, www.sleepapnea.com. 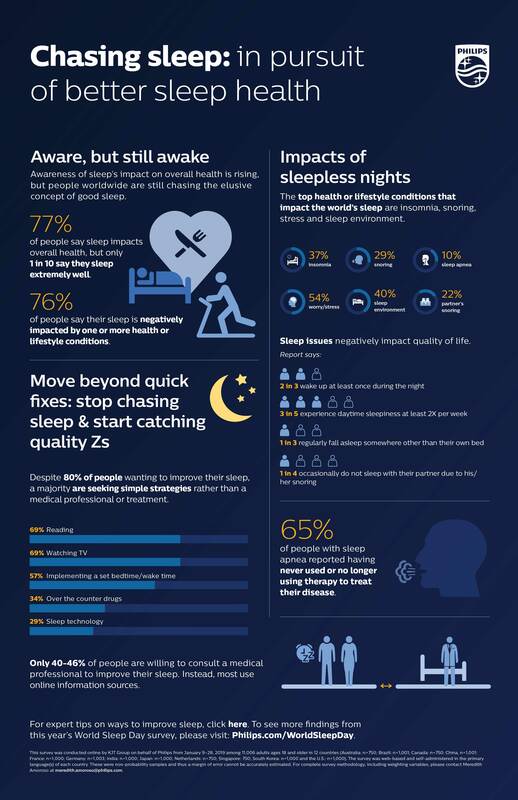 To view additional findings from this year or last year’s global survey, visit: Philips.com/WorldSleepDay. For more information on Philips’ advanced solutions for sleep and respiratory care, follow @PhilipsSleepWellness, @PhilipsResp or visit www.Philips.com/SmartSleep. Koray Karakaya is Innovation Lead at Philips HealthWorks with a strong focus on new business creation in healthcare. His drive and passion is to address complex healthcare solutions by combining internal and external innovation ecosystem. Connect with Koray on LinkedIn.